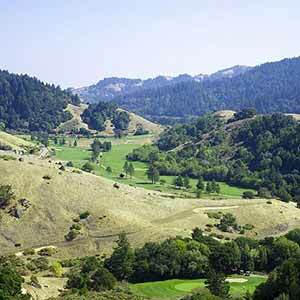 This enjoyable loop climbs to a wide-open grassy ridge with nice views of rolling hills and the Olema Valley. 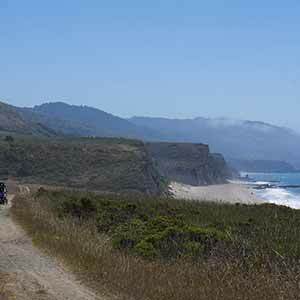 There are also a few miles on the redwood-lined Cross Marin biking trail, a pleasant and easy stroll despite constant traffic noise from Sir Francis Drake Boulevard. 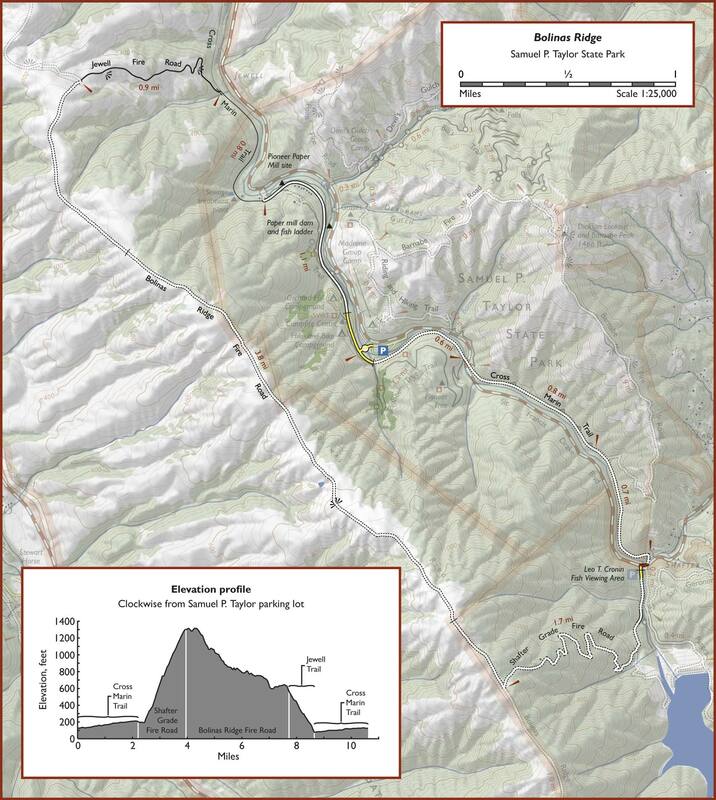 The loop is popular with mountain bikers, most of whom prefer to cycle in the counter-clockwise direction to avoid a steep climb up Shafter Grade. 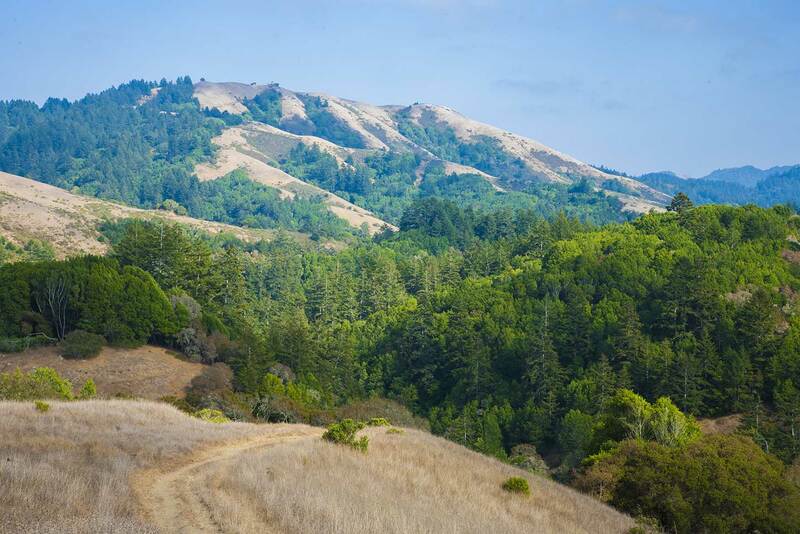 However, in this direction Bolinas Ridge Fire Road is an unpleasantly long uphill pull, during which you mostly see the dirt road rising up directly in front of you. 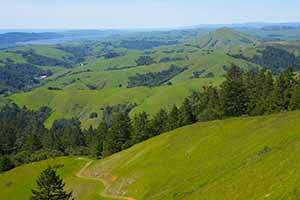 In contrast, hiking clockwise you’ll have a steep climb up Shafter Grade, but then there’s a long descent down Bolinas Ridge with some pretty nice sweeping views of the Olema Valley in front of you. The ridgetop fire roads can get unpleasantly muddy in the winter. Start at the Samuel P. Taylor parking lot. 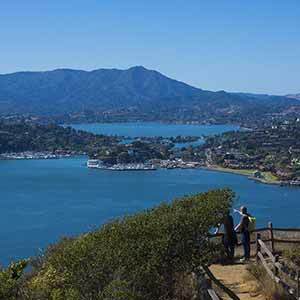 Walk along the road to the campgrounds, across the auto bridge, and turn left onto the Cross Marin Trail. The road is paved at first but soon becomes dirt. The wide leafy road parallels Sir Francis Drake Boulevard, at one point crossing it on a bridge. The Cross Marin Trail continues for several miles of flat, easy walking along a former railroad bed under second-growth redwoods. This path is popular with local walkers and cyclists as well as the campers from Camp Taylor. 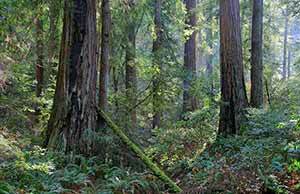 Typically for second growth in the bottom of a canyon, the redwoods are dark in color. There are also some maples and bay laurels along the stream. The Cross Marin Trail ends at the Inkwells Bridge, which crosses the creek and leaves you on Sir Francis Drake Boulevard. Cross the busy Boulevard and head right, across an auto bridge, to the Leo T. Cronin Fish Viewing Area. When the water is high you’re supposed to be able to view spawning salmon in the creek, but I’ve never seen any. This area has a small parking lot that’s open in the winter, but you’re not allowed to park there for more than a hour. 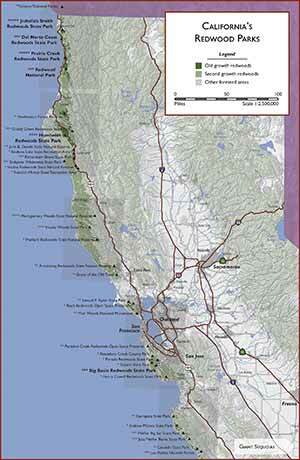 Walk through the fish viewing area and continue on the dirt road marked "Shafter Grade". 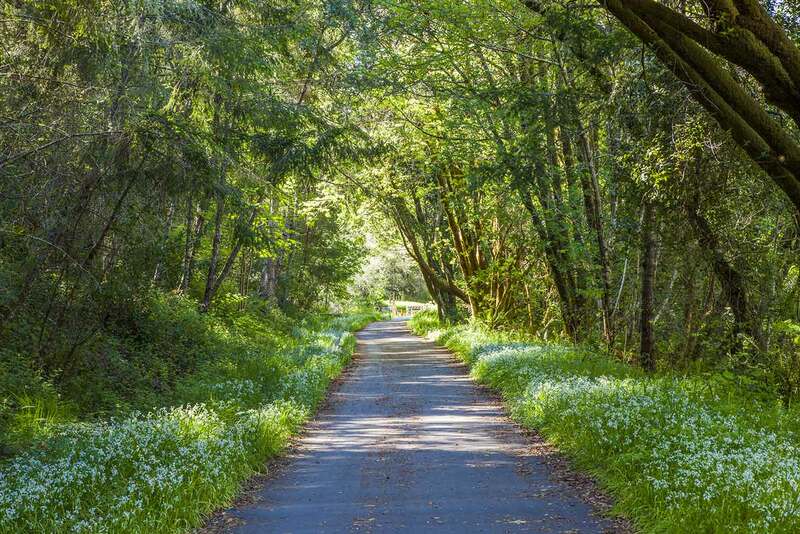 The road begins to climb steeply, winding through a lush and attractive second-growth redwood forest with a lot of bay laurel. Near the top, the redwoods give way to firs. The climb is difficult and it seems to go on forever, but at least the traffic noise is left behind. Shafter Grade Fire Road ends at a T intersection with the Bolinas Ridge Fire Road. To the left, the road passes through some redwood groves, eventually reaching Mount Tamalpais State Park. But that’s another hike, so turn left instead. The scenic road climbs a little more, winding through open fields and passing through a gate before cresting a hill. 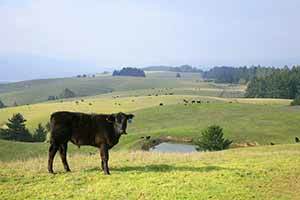 There’s a nice view of the ridgetop cow pastures with the rolling hills of the Olema Valley below. The dirt road actually passes through the cow pasture and on occasion cows may be standing around on the road and may start following you around. The road divides into two parallel roads as it reaches the bottom of a hill. The road to the left is a ranch road, while the one to the right is the fire road. Stay to the right, passing through a gate. 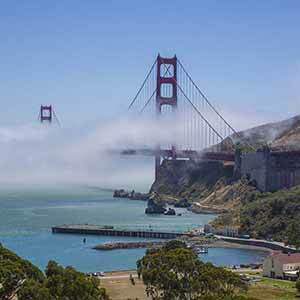 There follows a somewhat dull mile of road, with the views screened by a line of brush and trees to the left and the redwood forest to the right. After passing through another gate, the views open up again. 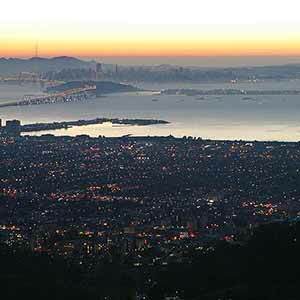 They’re even better than before, with a sweeping view over the Olema Valley; later, the town of Olema comes into view in the distance, sitting at the tip of Tomales Bay. As the trail descends, look for the little-used Jewell Fire Road to the right. To the left, the Bolinas Ridge Fire Road continues to descend through scenic pastures, eventually reaching Sir Francis Drake Boulevard. 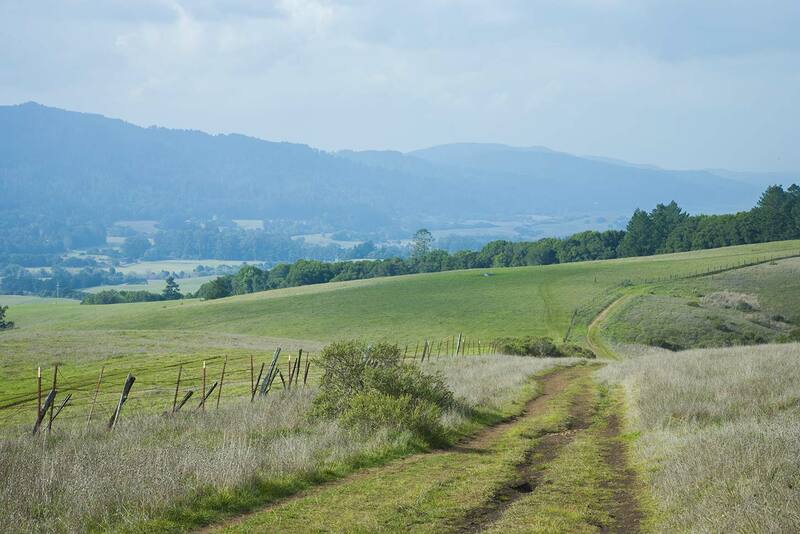 But that route would be too long, so instead head right on the Jewell Fire Road, which is also pretty scenic, with views of the San Geronimo Valley. Jewell Fire Road ends at the shady Cross Marin Trail, which is paved in this area. Turn right and head back to the Samuel P. Taylor parking lot. 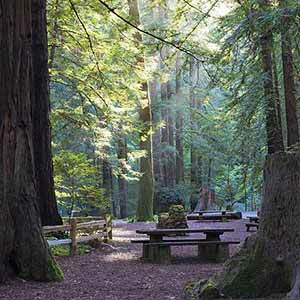 Part of the trail passes through a dense second-growth redwood grove; however, a long section around the old mill and town site has been completely cleared of redwoods.